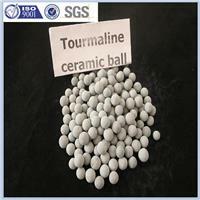 The tourmaline ceramic ball’s largest advantage is can permanently produce the weak current of 0.06mA; it is similar to the nerves of the current, to smooth blood circulation. 1)Tourmaline ceramic ball can release 0.06mA bioelectricity in the water and breakdown bigger molecule group of water into smaller one to activate water. Eradiate more than 85%~90% FIR (far infrared ray), make water (PH value is 7.5~8.5), antibacterial and release mineral microelements. 3) Tourmaline ceramic ball can be improved atopic dermatitis while bathing. water contains residual chlorine will stimulate the skin,tourmaline ceramic ball will stabilize the residual chlorine to be not irritating ones,then you can enjoy bathing. 4) Use of tourmaline ceramic ball, calcium, magnesium and silicon will not be attached on the inner wall of boiler,its easy to clean the boiler, and prevent attachment emerging again after using of tourmaline ceramic ball. Negative ion, also known as the air vitamin. It can help to regulate the human body ion balance, make physical and metal relaxation, activated the cell, improve the natural cure rate and so on. Meanwhile control the oxidation of the body or aging. In this modern environment, many factor can produce the positive ion, the body often feel tension. So negative ions are essential to modern material, furthermore, also has deodorant effect. Water molecules (H2O) does not exist alone; its elements will be combined to form a molecular beam. The smaller water in the molecular beam can remove chlorine or impurities. It taste good, also can improve the penetration of the body. far infrared can penetrate the deeper parts of the body, the warmth of cells and promote blood circulation, smooth the metabolism. Far infrared tourmaline force fired nearly 100%; it is higher than that of other minerals. Tourmaline have variety of natural minerals, many of which are as the same as the necessary minerals of body. With the current weak, it is very easy to absorb minerals, is an excellent source of minerals. Should wash with clean water for two times before treating water. Bio Ball,Ceramic ball, Mineral ceramic ball, Far-infrared ceramic ball, Negative potential ceramic ball, Germanium balls, Negative ion ceramic ball, Energy ceramic ball, Alkaline energy ceramic ball, Clay ball, Silica Hydride, Maifanstone ceramic ball , Calc-alkaline ceramic ball, Anti-bacterial ceramic ball.